I thought I would change things up a bit, from the usual founding father quotes, and go with something a tad more modern. I googled famous atheist quotes and found this. 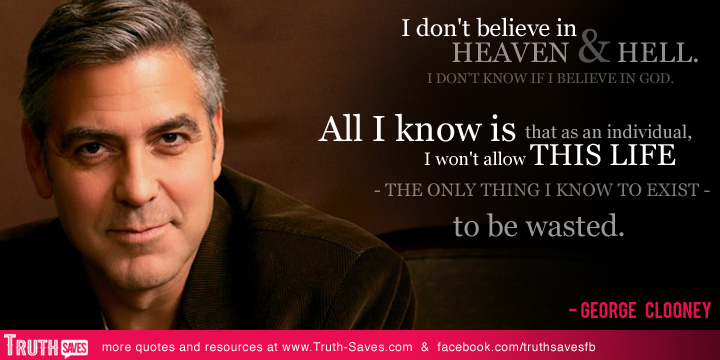 I had no idea Clooney was leaning atheist, he just went up a notch in my book. As for the quote, I like the second part best. I think we all should take this to heart. Live your life. Do something with yourself. Enjoy the things you enjoy. I know one thing for sure, and I may have this put on my headstone, “I have lived my life.” Have been all over this country as I grew up in a owner operator trucking family, played lead guitar in a local classic rock cover band, was a commercial diver for over 30 years, have a few kids, and a great wife. We all should be so fortunate, to have lived a little. Live! This entry was tagged Famous People, Famous Quotes. Bookmark the permalink.